This week brought with it at least two stunning pieces of news. The first is that highly decorated Olympic swimmer Michael Phelps does not swim as fast as a great white shark, even if he wears a simulated shark skin wetsuit and a ridiculous fin. The second, equally shocking revelation, is that within ten years, our dogs could be speaking to us. According to consumer futurologist William Higham (whose job is not nearly as made up as it sounds), the market demands a product that will allow the translation of dog barking. And it turns out Northern Arizona University biology professor emeritus and author of a book called Chasing Dr. Doolittle: Learning the Language of Animals, Con Slobodchikoff thinks it may be possible. And frankly, his job sounds way less made up. A few days ago, Amazon got super excited about this and said that when there is such a product, they will be happy to ship it to you via drone and then hound you for a review. And as anyone who has ever tried to sell a book can tell you, the market lives and dies on the word of Amazon. But it got me thinking whether I really do want to know what my dog has to say. Alexander Graham Bell, of telephone inventing fame, decided when he was a young man of twenty that he did want to know what his dog Trouve had to say. With both an elocutionist for a father and a mother who was nearly deaf, Bell became fascinated at an early age with how sound could be transformed by the shape of one’s mouth. So he did what I’m sure any of us would have done. He taught his skye terrier to produce a sustained growl on command and then manipulated the dog’s mouth to approximate the words “How are you, Grandmama?” I imagine the interpretation took a little bit of imagination, but the discovery that it could be done led Bell in some interesting directions in his studies of speech and sound transmission. Sometimes I do wish my dog could speak English, or at least that we could understand one another a little better. Almost two weeks ago, my family and I went out of town for the weekend and Ozzie got to spend a couple days in the kennel. We have a great kennel and Ozzie is a very social dog, so he gets really excited when we take him there, but this time, the poor thing caught a cold. Several days after we got back, we noticed he had begun to sneeze more often than normal, and even cough a little. He was especially sleepy and didn’t seem to feel very well. We took him to the vet. Ozzie came home with antibiotics he was not convinced he wanted to take. I wished I could explain to him the importance of the pills and that they will help him feel better, or at least prevent him from feeling even worse. Instead, I have to break them open and mix the medicine with peanut butter. And all I can do is let him lay his head on my lap so he can breathe a little easier while I scratch behind his ears. So, I suppose we communicate just fine. Whether he understands that I’m trying to help or that the yuck he’s feeling is temporary, I don’t know. But he likes peanut butter (even when it’s laced with amoxicillin) and I think he at least knows I care. Hopefully Trouve understood that, too. According to Bell, the dog enjoyed the attention and the treats that came along with his elocution lessons. Despite rumors to the contrary, Bell’s terrier never became a great orator. The inventor admitted he was never able to train the dog to make the sounds on his own. Of course it’s always possible that Trouve was just kind of a jerk who didn’t really care how Grandmama was doing. And that’s the real concern I think. Because what if, after the Amazon drone delivers my dog interpretation device, I discover that I don’t care much for what my furry companion has to say. Ozzie is pretty expressive already. He tells me quite clearly when he needs to spend some private time outside and when it’s time for me to give him a treat. He can’t resist happily howling along when the boys play the piano, but seems to care not at all for the guitar and ukulele. He rests at my feet as I write, and stares at me with kind brown eyes when I read to him from my work, or pretend that I’m talking to him and not just to myself. I suppose I’m just afraid to know what he’s really thinking at those times. What if he calls me names when I’m slower than he’d like to let him out or get him a treat? What if the lyrics he’s put to the piano tunes have no sense of poetry? What if he’s critical of my words? All things considered, I think I like our relationship the way it is. I like telling him how much I love him with a scratch behind the ears. And I like assuming that he does care very much how Grandmama is doing. In 1820, nineteen-year-old Isaac Van Amburgh accepted a position with the Zoological Institute of New York, as the cage boy whose job it was to clean out the cages of the exotic animals kept by the traveling menagerie. To say it was his dream job would probably be a bit of a stretch, but like most of us, Isaac had to do some grunt work before he got his big break. That break came just a year later when one of the owners of the menagerie saw that young Isaac had a way with the lions. It turned out he had a knack for training them. He would eventually go on become the person most often credited with beginning the art of lion taming for show, an act that would become as linked with the circus as clowns, elephants, and P.T. Barnum. For this reason, when my oldest son realized a camp he attends would have a circus theme this year and for one of their special events, he would need a circus-themed costume, he chose to be a lion tamer. And because he’s an extremely clever kid with a quirky sense of humor, he decided to be a lion tamer who is allergic to cats. I love the way he thinks, but he may be overconfident in my skill as a costumer. I like to believe I’m fairly clever, too, and I can be crafty when called upon. Like my own mother always did, I keep a few pieces of poster board stuffed behind my dresser just in case one of my kids suddenly remembers the science fair is tomorrow. And I barely batted an eye when he came home from school earlier this year needing an Egyptian pharaoh costume for a social studies speech the next day. Thank goodness bathrobes are so versatile. He may make you sneeze, but that lion doesn’t look so dangerous. But then after weeks of asking him if he had a handle on his lion tamer costume, he finally told me a few days before camp, all he needed was a lion and a red tuxedo jacket, preferably with sequins. I don’t know if you’ve ever tried to find a red tuxedo jacket for a twelve-year-old on a poster board budget and with two days notice, but it’s not exactly an easy task. What we came up with was a red raincoat that with a great deal of red duct tape and some shiny gold craft tape looked kind of okay from a distance. And really, keeping a lion tamer at a distance probably isn’t such a bad idea anyway. Because lions are wild animals, and unless you are Isaac Van Amburgh, they may bite off your head. Actually it’s surprising they didn’t do just that to Van Amburgh, who earned himself a great deal of fame and wealth by becoming the first man to stick his head inside the open jaws of a lion. We’re talking the kind of fame that won him the attention of Queen Victoria, who even became a groupie of his for a time, taking the time to catch his act about half a dozen times in a matter of weeks. And this was even in the days before YouTube. The queen was so taken with the performance that she commissioned a painting of her favorite daring (and incredibly stupid) animal trainer. In it, Van Amburgh is pictured wearing a Roman gladiator ensemble, his preferred costume since shiny red tuxedo jackets can be challenging to find. Van Amburgh’s show did receive a fair share of criticism, too. He was, according to his publicity agent, terribly abusive to the large cats, basically beating and strategically starving them into submission. Had he gotten his head chomped by one of them, he’d probably have gotten what he deserved. Instead, Van Amburgh had a heart attack and died in his bed in 1865. He was only 54 at the time, but for a guy who made his living putting his head into the open mouths of angry, hungry lions, I’d say he lived a pretty long life. In the early part of the fourth century BC, a historian by the name of Ctesias returned to his native Greece after traveling through India and Persia, where he served a number of years as physician to the royal court. When he got home, he set to work writing about his travels in his great works Persica, which like many of the era’s works of history is somewhat dubious in nature, and Indica, which among other things, describes India’s native unicorn. The unicorn, he wrote, was as large as a horse, with blue eyes, a red head, a white body, and a horn on its head measuring at least a foot and a half. It was also very strong and lightning fast. Ctesias offers us the first written account of this elusive animal, but he certainly wasn’t the only “scholar” to write about it. Among those who mention the beast are Pliny the Elder, Saint Isidore of Seville, and Marco Polo. The unicorn even gets a nod in some translations of the Bible (I’m pretty sure the LSD translation is on the list). Of course none of these writings seem to be eye-witness accounts, and the descriptions vary (some may more closely resemble a rhinoceros, which definitely is real), but for a good part of human history, there was little doubt of the unicorn’s existence. Its horn has been pulverized to make an antidote for poisons, it’s been used as a religious symbol of purity, and it’s even graced symbols of state. Today’s unicorn is a little sleeker, a little sparklier, and a little more make-believe (though I hear Animal Planet is planning a show called Hunting Unicorns, which will air just as soon as they find Bigfoot). The unicorn of today also seems to have a hard time holding on to its lunch (which I have to assume is made up primarily of Skittles) because the creatures are frequently depicted puking rainbows. Yep. This sure makes me thirsty for something with sugar and sparkles. I have to wonder if that’s what Starbucks was hoping to call to mind when they introduced their Unicorn Frappuccino last week. The multi-colored sugar bomb lasted only five days, and was even sold out at many stores faster than that, proving as difficult to catch as the unicorn itself. I’m certainly not complaining. As a more or less non-coffee drinker, I have one Starbucks order I’ve convinced myself I enjoy when I occasionally have to meet up there, and the Unicorn Frappuccino isn’t it. But if they were still making them, then for the purpose of thorough research I suppose I would have gotten one just to take a picture. I might even have tried a sip so as to not anger the barista who just spent the last hour making 437 of them and is starting to take on a strange pink and blue hue. Since I didn’t get the drink you’ll just have to use your imagination. Picture this in a cup topped with whipped cream and pink and blue sprinkles. So I didn’t catch a unicorn myself, but for a few days there I sure did hear a lot of rumors of their existence. I see from the Internet buzz that some Starbucks stores are now offering a Dragon Frappuccino made with green tea and magic and probably also a lot of sugar. I think I’ll pass on that one as well, but perhaps you’d like to try it. If you tried the Unicorn Frappuccino, I’m curious, what did you think? Should Starbucks bring it back and make it a permanent offering, or did it make you puke rainbows like a unicorn? With Easter Sunday nearly upon us, it’s probably time we talk about rabbits. I have a complicated relationship with these admittedly adorable creatures. My first favorite stuffed animal was a floppy-eared bunny I received at Easter. My youngest son, too, has a stuffed bunny that is near and dear to his heart, enough so that when he was younger, there were many nights of frantic searching for “Bunny,” who always managed to disappear at bedtime leaving behind one inconsolable little boy. And then there’s the Easter Bunny, one of a very few species of mammals to lay eggs, and the only one known to lay eggs filled with candy. This creature is also commonly classified as a rarely seen and likely nonexistent animal (like Big Foot), a creeper sent to spy on naughty children (like the elf on the shelf), or a guy in a scary costume that makes small children cry in the middle of the mall commons (like our favorite jolly fat man). But where does this strange critter come from? The answer to that may be as hard to find as a favorite stuffed bunny at bedtime (make sure you check outside in the wet grass next to the play set). There are references to the Easter Bunny as early as the 16th century in Germany where it seems likely the tradition was born. The only bunny I’ve ever liked. And speculation that rabbits and hares became linked to the holiday because they are the animals most closely associated with the pagan goddess Ostara, traces its roots back to the connection of the goddess with the Christian holiday. That connection was first postulated by the 8th century monk and (practical) historian known as the Venerable Bede, who a lot of scholars now think probably just kind of made it up. That didn’t stop Jacob Grimm (of fairytale-telling fame) from spreading the rumor in 1835, nor does it slow the annual onslaught of internet claims that Easter is little more than the Christian commandeering of yet another pagan holiday (which, even according to quite a few pagan scholars, it’s not). But that still doesn’t explain why a bunny brings a basket of eggs, a common symbol of fertility and new life, to hide for the kiddos on Easter. All we really know is that the tradition seems to come out of German Lutheranism in various forms, all involving the hiding of colored eggs by an animal. The species of the egg-bearer varied by region, showing up sometimes as a rabbit, but in other places as a rooster, a cuckoo, a stork, or a fox. Eventually the rabbit won the day. By the time German immigrants began arriving in large numbers in America in the 1700s, they brought the Easter Bunny with them. Well, I’m fond of this one, too. Now that my son is getting older, it doesn’t hippity hop through my yard much anymore, but I didn’t really mind. Except at bedtime. But as I mentioned at the beginning of this post, I have a complicated relationship with bunnies. On the one hand, they are adorable. And on the other hand, I hate them. Because while the Easter Bunny brings candy, plain ol’ bunnies hippity hop through my neighborhood with impunity. These monstrous little nose-wigglers descend every spring to destroy my carrot, beet, and lettuce crops, decimate my blueberry bushes, and even nibble the life out of the new little tree shoots that have done nothing to deserve this harsh treatment. The demons dig ankle-spraining holes in my yard (never once having the decency to leave a candy-filled egg inside) and relentlessly taunt my dog who is well-intentioned, but too slow to catch them. My poor dog would like to add another argument against the Easter Bunny. So here’s my proposal. Let’s go back to the Easter Fox. Foxes are shy enough you rarely see them. They’re also kind of cute, but much easier to say no to when your son begs for one as a pet, and they will pretty much leave your beet crop untouched. Also, in the wild, though foxes do not lay eggs (and neither do bunnies, in case you weren’t clear on that), they do tend to steal and occasionally hide them. Also (and I think it’s safe to say this is the most important point) adopting the fox as the official mascot of Easter would effectively put an end to all this “Hoppy Easter” nonsense. So it just makes sense. Or at least it makes as much sense as the Easter Bunny. On September 10, 1945, a farmer by the name of Lloyd Olsen was expecting his mother-in-law for a visit and so he set about doing the unsavory work of killing a chicken for dinner. He scooped up a young rooster scratching and pecking its way through the barnyard and dealt the fatal blow. Except that it wasn’t. The rooster staggered like any freshly killed chicken might, but unlike most, this one never stopped. Astonished, Lloyd decided not to serve the determined bird for dinner that night and the next morning found it sleeping soundly with its phantom head tucked under its wing. A group of skeptical headless chicken experts at the University of Utah agreed with him. It seems when Lloyd lopped off Mike’s head, the farmer somehow managed to miss the jugular vein and a very lucky clot kept Mike from bleeding out. With most of his brain stem still attached (though the larger part of his head would soon reside in a jar), Mike was still a remarkably healthy rooster. It probably doesn’t come as much of a surprise to the average chicken farmer, but it turns out chickens (which have bird brains to begin with) don’t actually need great deal of brain power to get by. Mike lived quite happily, raking in a tidy little sum for the Olsens (his would-be murderers), until he finally managed to choke to death eighteen months later in a motel in the middle of Arizona. But don’t be sad, because Mike’s determined spirit remains alive and well in his hometown of Fruita, California where every year on the first weekend in June, they celebrate the Mike the Headless Chicken Festival. That’s right. This very weekend (since I’m sure you don’t have better things to do), you can hop over to Fruita and run a 5K or participate in a disc golf tournament. If you have a prize chicken of your own (headless or not), you can enter it into a poultry show, or you can try your hand at rooster calling, chicken dancing, or peep eating. Because people will celebrate pretty much anything. For example, just a few of the quirky celebrations you could attend in the United States this summer include: the Mosquito Festival in Clute, Texas, the Humongous Fungus Festival in Crystal Falls, Michigan, and the Road-Kill Cook off Festival in Marlinton, West Virginia. A book galley. Without a head. I am delighted to announce that this fall (maybe as early as October), I will finally become a traditionally published novelist, a goal I’ve been working toward for a very long time. I hope you’ll take a moment to click on the new page, celebrate with me, and maybe even sign up to receive an occasional e-mail about the progress of the project and some other fun stuff. I won’t be holding a mosquito calling contest (which just sounds like a bad idea) or crowning anyone “Miss Roadkill” (or “Miss Practical Historian” because that tiara is all mine). But I will be letting readers in on some exclusive content that I’m sure you’d hate missing out on even more than you’d hate missing the opportunity to don your mask and snorkel to attend the Underwater Music Festival in the Florida Keys National Marine Sanctuary. The book, a historical novel, has no official title yet, because my publisher and I haven’t yet agreed on the perfect fit, and it has no cover yet because the brilliant graphic designer I’m working with is patiently awaiting a title so he can finish his lovely design. But I assure you that what I do have is a fine specimen of a novel except for not having a head. While the truth of the existence of Mike the Headless Chicken has occasionally been called into question, despite the testimony of several of Utah’s finest headless chicken experts, I assure you, the book really is coming soon. And headless or not, I think it’s worth celebrating. If you read this blog very often, or if you’ve read the “About This Blog” page, then you know, I don’t do politics in this space. I only rarely even skirt the edge of controversy, because there should be some places on the Internet where you can just have fun and not be offensive or offended, and we all have different opinions, different experiences, and different perspectives. That being said, in life, I do politics. This has been a weird political season in the US, and a stressful week. No matter what end of the political spectrum you find yourself on most of the time, I think we can all agree that the future looks a little frightening. 1. A woman who is at best an blithering nincompoop who can’t figure out how to use her cell phone and thinks one wipes a server with the swipe of a cloth, or who is at worst a traitor guilty of granting political influence by foreign heads of state in exchange for lucrative speaking engagements. 2. A man who is at best an incompetent businessman whose ventures have only been highly successful in the area of declaring bankruptcy and screwing over investors and who has now managed to insult (probably literally) every person on earth, or who is at worst a narcissistic fascist megalomaniac. I have a lot to say on this topic, but I will spare you. I could use a break, and I’d rather write about my dog. First, I should explain how I feel about dogs in general. I think they smell funny. And they slobber a lot. They bark when they shouldn’t. And they are incredibly needy. Chubby dog basking in the sunlight, just hoping I’ll shut down the computer and take him for a much needed walk. Despite the fact that I would not have considered myself a “dog person,” a couple years ago my family adopted a little black puppy we named Ozzie. That alone is a great story, for another time. What’s important to know now is that I love my dog. I’m pretty sure that the Ancient Egyptian owner of Abuwtiyuw felt the same about his furry companion, who lived sometime during the Sixth Dynasty (2345-2181 BC) and was buried near the Great Pyramid of Giza. Discovered in 1935 by Egyptologist George Reisner, a tablet that was part of the repurposed material used to build a different tomb, gives detailed instructions about the elaborate burial of a dog. There’s no picture of the dog, but he is described as a tesem, a breed similar to a greyhound or saluki, but with pointier ears. And what’s really cool about it, is that even though the tomb and mummy of the dog remain undiscovered, Abuwtiyuw is the earliest domesticated dog whose name we know. Because his owner (a pharaoh whose name remains unknown) loved him enough to want to make sure he was taken care of. That’s what good pet owners do. Even if we don’t expect to love them, the little monsters worm their ways into our hearts and we take good care of them, because they take good care of us. Ozzie, striking his most presidential pose. So earlier this week, I took good care of Ozzie by taking him for his annual checkup and vaccinations. The good news is he’s a very healthy two-year-old dog. The bad news is he’s gotten a little chunky over the winter. The vet’s exact words were, “He’s got some love handles.” So as the weather warms up this spring, we will be extra diligent in making sure Ozzie gets plenty of exercise so he can remain a happy, healthy dog. That’s what I was thinking as my chubby pet and I waddled away from the vet’s office. And then I found myself reflecting on how amazing it is that I live in a nation where I am so absolutely blessed that not only can I provide my dog with regular medical care (a luxury many people throughout the world can’t even provide for their children), but he also eats so well that he’s overweight. Someday when he dies, I bet I could even provide a funeral for him in a swanky pet cemetery (though I probably won’t). He even kisses babies. Or at least he takes food from them. And now I think I’m beginning to see the problem. So come this November, I may have to decide whether I can vote for a person I might not trust to walk my overweight dog. But for now, I’m going to focus on the fact that I live in a nation so blessed, our dogs have love handles. I’m still not a dog person. In fact, one thing I can say with a fair amount of certainty is that your dog smells funny, slobbers a lot, barks when he shouldn’t, and is incredibly needy. Ozzie, on the other hand, is all of that, but also happens to be a fuzzy, warm, loving (and maybe just a little chubby) bundle of awesome. Maybe I’ll vote for him for president. 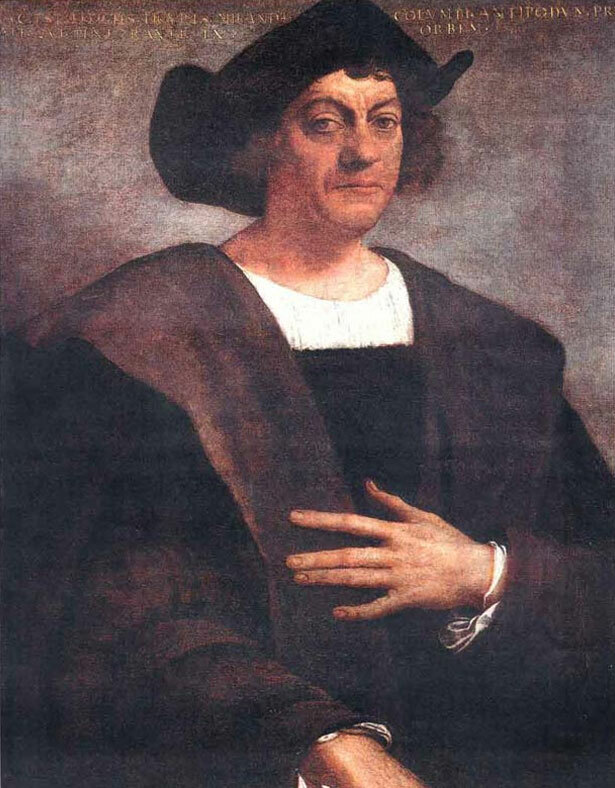 On September 18, 1502, on his fourth and final voyage to the New World (which he still stubbornly insisted was Asia, because by then he was becoming a little floopy) Christopher Columbus arrived in what would come to be known as Costa Rica. I say “arrived” because “discovered” is certainly the wrong word, as he was warmly greeted by canoes full of Carib Indians, representing one of four indigenous tribes living in the area at the time. In fact, archaeologists have uncovered evidence of human occupation in Costa Rica dating back at least 10,000 years. A large variety of tools, weapons, metal work, and even remnants of an ancient city complete with aqueducts indicate that many cultures may have come, gone, and coexisted through the area. But its rich history of human diversity isn’t all that makes the country so fascinating, because representing just one third of one percent of Earth’s landmass, Costa Rica contains approximately four percent of the species that exist on the entire planet. It boasts the highest density of biodiversity of any country in the world, with hundreds of species that, outside of captivity, can only be found there. 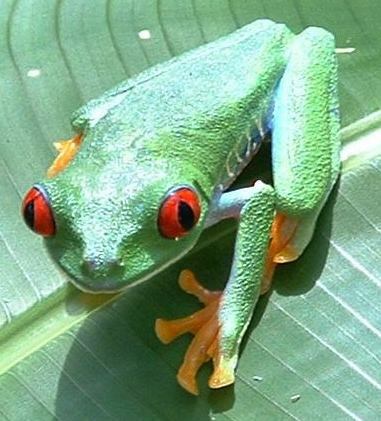 And Costa Rica is home to somewhere in the neighborhood of 175 species of amphibians. Eighty-five percent of those are frogs. It’s got the poison dart frogs, the famous red-eyed tree frog, the giant toad, and the rainforest rocket frog, which at a length of about half and inch is not the smallest frog in the world, but it does have the coolest name. And now there’s one more frog in Costa Rica, because recently researcher Brian Kubicki found a previously undiscovered glass frog he named Hyalinobatrachium dianae. Like in so much of the world, Costa Rican species are being stressed by rapid environmental change and the country has already lost many frog species to extinction. So to discover a new one is pretty exciting. Especially when the Internet decides that new species looks like Kermit the Frog. And it does, kind of, at least in the same way that if you put a domestic pig in a blonde wig and taught it karate, it would totally resemble Miss Piggy. The new frog does have similar coloring to Kermit, except on its belly where its skin is nearly transparent so you can see all of its internal organs. It also has big white eyes that bug out of its head, and like its Muppet counterpart, H. dianae plays the banjo and harbors a not-so-secret wish to make it big in showbiz. So the only real question remaining is what is Kermit the Frog doing in Costa Rica? Because as everyone who has seen the straight-to-video classic Kermit’s Swamp Years knows (and judging by the reviews that could be as many as a dozen people or more), Kermit is originally from the swamps of the Deep South, not Costa Rica. The answer to the question may lie in the years he spent as a hard-hitting investigative journalist at Sesame Street News. 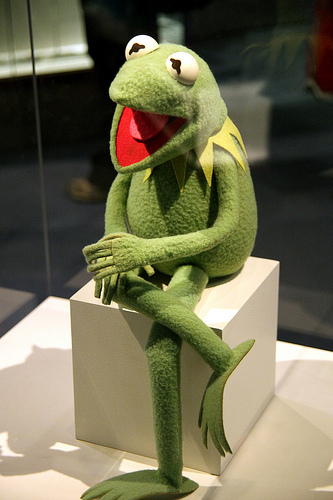 As something of a hard-hitting investigative journalist myself, I have uncovered footage from Kermit’s past that may explain the link between the famous Muppet and this new little glass frog now taking the Internet by storm, a link drawn straight through the famous explorer Christopher Columbus who accidentally stumbled onto Costa Rica so many years ago. Enjoy!